Elsa had a personality change at the last minute. 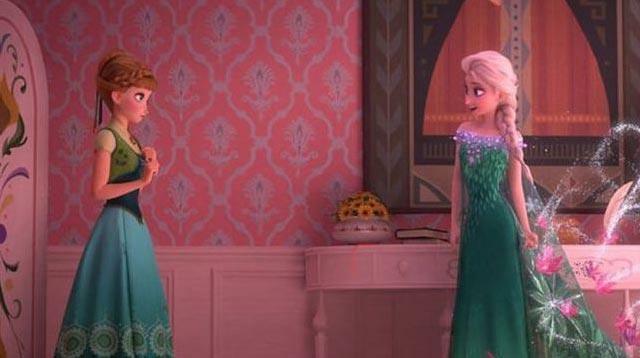 Seeing as Frozen is perfect as it is (could do with being an hour longer, though), it's a good job Disney decided to change the initial ending—after a producer revealed that it was very nearly totally different. "Elsa was a self-proclaimed Snow Queen, but she was a villain and pure evil—much more like the Hans Christian Andersen tale. We started out with an evil female villain and an innocent female heroine and the ending involved a big epic battle with snow monsters that Elsa had created as her army. "Making them related led us to the idea of her living in fear of her powers," he explained. "Now we had a character in Anna who was all about love and Elsa who was all about fear. "That led to making Elsa a much more dimensional, sympathetic character, and instead of the traditional good vs. evil theme we had one that we felt was more relatable: Love vs. fear, and the premise of the movie became that love is stronger than fear." Woah. So it was through making them sisters that producers managed to make us sympathetic towards Elsa as well as protective of Anna? Cleeeeever. Del Vecho added that the team behind the film then questioned the need for a man to swoop in and thaw Anna's heart, with director Chris Buck instead ditching the Disney Prince idea all together. "Chris said, 'Does it always need to be true love's kiss that solves that problem? Does it always have to be the man who comes in and rescues the female? Could it be something different?' And that led to a different ending." These Frozen women don't need no man.